The Thunderbirds, who have a bye this week, end regular season with eight-game win streak. SAN ANTONIO — There’s at least one thing that can be said about Wagner’s dominant sweep of District 13-5A Division I this season: The Thunderbirds know how to take care of business. Heavily favored to win its first football district title in school history, after dropping from Class 6A to 5A in this year’s UIL realignment, Wagner never grew complacent. While they had a sizable advantage over their league opponents in athletic ability, the Thunderbirds kept their eyes on the prize and never lost focus. 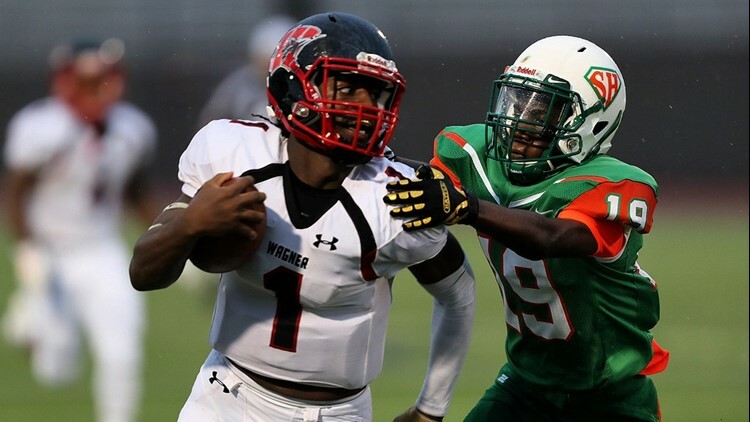 Wagner, which has a bye this week, finished its regular season 9-1 and went 8-0 in district play. The Thunderbirds simply overwhelmed their league opponents, outscoring them 522-29 and recording five shutouts. Only Highlands managed to score two touchdowns in district play against Wagner, which beat the Owls 75-15. The Thunderbirds have won eight straight since losing to Judson ISD rival Judson 35-28 in their annual Hammer Bowl. The seven-point margin of victory is the smallest for the Rockets this season. 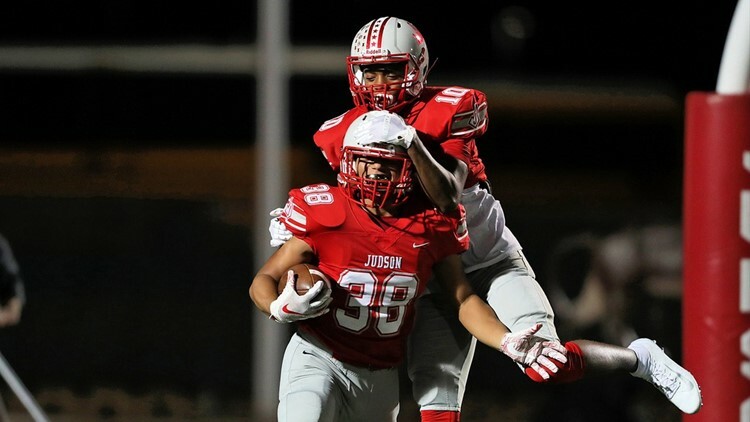 Judson (8-0) and Wagner remain No. 1 in the KENS5.com 6A and Sub-6A area rankings, respectively. The Rockets are also No. 3 in the Associated Press 6A state poll. O’Connor, No. 2 in the 6A rankings at 9-0, won its third consecutive 28-6A championship with a 30-23 victory against Brennan. The Panthers are one win away from their second straight 10-0 regular season. In 27-6A, No. 3 Madison (7-2, 6-0) can win its first district title since 2012 with a victory against No. 7 Johnson (7-2, 5-1) on Friday night at Comalander Stadium. Reagan (7-2, 5-1) is tied with Johnson, the district’s defending champion, but the former beat the latter in their district opener. The Madison football program fell on hard times after local high school coaching icon Jim Streety retired following the 2013 season. The Mavericks went 12-30, including 0-10 in 2015, in four seasons under three different coaches. But Madison’s turnaround in 2018 has been one of the storylines of the San Antonio-area season. The skinny: Judson remains No. 3 in Associated Press Class 6A state poll. The skinny: Panthers one win away from second consecutive 10-0 season. The skinny: Win in this week's regular-season finale would give Madison first district title since 2012. The skinny: Reagan and Johnson trail 27-6A leader Madison by one game. The skinny: Bears in a three-way tie for second in 28-6A heading into regular-season finale. The skinny: Broncos have won three straight since losing to district leader O'Connor. The skinny: Jaguars can win second straight district title with win over Madison. The skinny: Knights bounced back from gut-wrenching two-point loss to Smithson Valley. The skinny: Buffaloes face supreme test this week. The skinny: Warren rebounded from loss to Brandeis. The skinny: Thunderbirds shut out five district opponents and allowed just 29 points in eight league games. The skinny: Antlers are one win away from district championship. The skinny: Dragons clinched district championhip with victory over Harlan. This week: vs. Eagle Pass Winn, Friday, 7:30 p.m., Dragon Stadium, Southwest H.S. The skinny: Mules bounced back from triple-overtime loss to Tivy with big win. This week: vs. No. 7 Boerne Champion, Friday, 7:30 p.m., Orem Stadium, Alamo Heights H.S. The skinny: Despite loss to Heights, Medina Valley still has shot at district championship. This week: at No. 2 Kerrville Tivy, Friday, 7:30 p.m. The skinny: Greyhounds can wrap up outright district title with win this week. This week: at Gonzales, Friday, 7:30 p.m. The skinny: Chargers already have clinched playoff spot. This week: at No. 4 Alamo Heights, Friday, 7:30 p.m. The skinny: Navarro tied for second with Wimberley, which it beat a week before losing to Cuero. The skinny: Hawks have lost two straight going into regular-season finale against league leader Liberty Hill. This week: at Liberty Hill, Friday, 7:30 p.m. The skinny: Veterans Memorial plays Sam Houston for second place in district race.